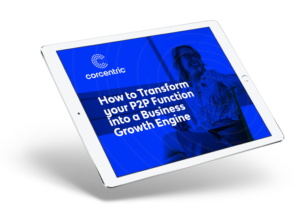 A recent IOFM white paper, sponsored by Corcentric, follows the challenges and trends transforming the role of procure-to-pay in the enterprise. Every department in every business today needs to prove its value to the enterprise. Simply performing a function is no longer enough, especially when it comes to the finance functions of accounts payable and its interaction with procurement. These departments both need to become strategic players, providing the means for company growth and profitability. The APP2P Network of the Institute of Finance & Management (IOFM) recently published a white paper “The State of Procure-to-Pay in 2016,” that illustrates how the role of procure-to-pay has changed, due in part to globalization, advances in technology, and a growing focus on financial visibility and reporting. The paper identifies the five major trends in procure-to-pay. Migration to the cloud – One of the main concerns of companies looking to automate their AP departments was cost and time concerns. But the growth of Software-as-a-Service (SaaS) providers has made that concern all but disappear. Today’s cloud-based solutions need no upfront investment in hardware and software and require minimal involvement on the part of IT. Both customers and vendors benefit from this technology as many solutions include portals that give both buyers and sellers 24/7 visibility into their invoicing and payment status. Move to mobile devices to approve invoices. – The growth in PCs and laptops has been bypassed significantly by the growth in smartphones and tablets. As people depend more on these devices, they’ll need to be able to perform their job functions on those same devices. That includes invoice approval. According to the white paper, 37 percent of businesses expect to use a smartphone or tablet to capture supplier invoices within the next two years. Growth in purchase of goods electronically – Automation speeds up every part of the procure-to-pay process; that’s why 82 percent of respondents to an Ardent Partners survey now use e-procurement solutions. Automation cuts in half the average time to place a purchase order and more than doubles the number of POs now processed by FTEs. This practice also guarantees price validation and contract compliance and the normalization of POs, ASNs, and invoices. E-invoicing is now mainstream – Companies and their suppliers are acknowledging the value of electronic invoicing. That’s why it ranks among the highest priorities, according to the IOFM 2015 Accounts Payable Technology Survey. By streamlining the workflow approval process, approval times can be cut by over half. The same holds true for the cost of processing an invoice; e-invoicing cuts costs by more than half. Increased focus on reporting and analytics – Those in the C-suite are ultimately held responsible for the up or down trajectory of a company. That’s why an increasing number of those executives are now looking to analytics and reporting to give them more “precision and efficiency in working capital management, cash forecasting, period end close, and reconciliation and consolidation activity.” Automated procure-to-pay solutions include robust reporting and analytics for working capital management, regulatory compliance, auditing, and operational improvement.